As Serbia enters its second year of official negotiations to join the European Union, a row over the freedom of the press is developing between the country’s prime minister and Brussels. ...the Ombudsman of Serbia warned of an 'emergency situation' in terms of freedom of expression in Serbia. 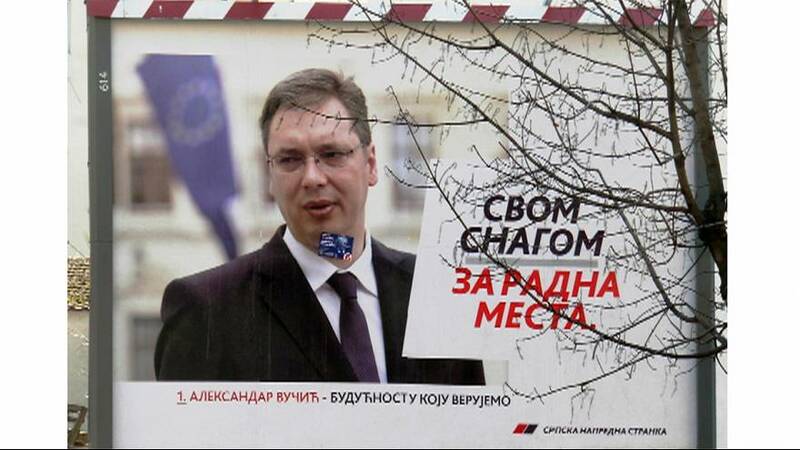 Aleksandar Vučić, who took office last April, has accused the EU of orchestrating a media campaign against him and paying journalists to slander his government. His allegation came after the publication of a report by the Balkan Investigative Reporting Network (BIRN), an EU-funded project whose mission is to highlight corruption issues in Serbia. The report questions a decision to award a government tender for crucial construction work on a key coal mine to what it claims is an inexperienced local consortium. Vučić insists the tender respected the law and was awarded to the company offering the best price. The BIRN accusations, he says, are an attempt by the EU’s envoy to Serbia to undermine his government. A former ultra-nationalist, Vučić served as Information Minister in the late 1990s, when he led strict media laws to silence dissent of the autocratic strongman president at the time, Slobodan Milosevic. Vučić later renounced his political past and since 2008 has been a vocal supporter of Serbian EU membership. He was Minister of Defence for 13 months until September 2013, before - as leader of the Serbian Progressive Party – being elected Prime Minister of Serbia. For more insight, euronews spoke to one critic of the current Serbian government’s record regarding the freedom of expression and the freedom of the press. Marko Čeperković is an MA candidate in Political and Administrative Studies at the Bruges-based College of Europe. Marko Čeperković: The Prime Minister elaborated that the EU Mission in Serbia is using its funds to support anti-government organisations that slander the government. Moreover, at a news conference held at the Serbian government following the publication of the BIRN’s report, Mr. Vučić stated that the EU is sponsoring “the same organisations who lied about the Air Serbia deal, as well as reported wrongly on the government’s management of the emergency situation during the flooding in May”(Link). Yet, at the end of his statement, the Mr. Vučić, acknowledged that media freedom is essential and said that his government is not trying to censor it. What do Vučić’s critics say? Marko Čeperković: Independent media associations in Serbia claim that this is indicative of the situation in the country regarding media freedoms, which is effectively worsening by the day. The Independent Alliance of the Journalist of Serbia (NUNS) and the Alliance of the Journalist of Serbia stated that the Serbian Progressive Party, the political party currently in power and a majority in the Parliament, led by Mr. Vučić, is using media outlets to the fullest extent in order to further their influence and appeal. Recent research published by Cenzolovka (‘Censortrap’) shows that the Prime Minister was featured 877 times on the front page of the 10 most influential print media in Serbia in 2014, and out of that number only 6 times in a negative context. They warn that the media as part of civil society rather than a platform for discussion and dissenting views, in this case becomes a marionette vehicle of norm creation, which is dangerous for the quality of democracy in the country. Membership talks stalled for many years due to concerns Serbia was not fully cooperating with the UN's International Criminal Tribunal for the former Yugoslavia (ICTY); several indicted war crimes suspects were thought to be in hiding in Serbia. After the last two wanted men, Ratko Mladić and Goran Hadžić were arrested and extradited from Serbia, the European Council awarded the country official candidate status for EU membership in 2012. Full membership negotiations started officially on January 21, 2014. Have there been other concerning cases of limiting press freedom in Serbia? Marko Čeperković: The problems in this sphere became public for the first time in June 2014 after Mr. Vučić had an overt confrontation with Ms. Dunja Mijatović, the OSCE freedom and media representative. At a conference devoted to the Internet media in Stockholm, Ms. Mijatović expressed her opinion of a “worrying trend of online censorship in Serbia,” which was featured in the Voice of America (Link). In this particular case she was referring to the recent hacker attacks on Peščanik, a web-portal that publishes opinion pieces written by intellectuals who promote the values of civil society. These attacks occurred after the portal had published an article claiming that the Minister of the Interior, Nebojša Stefanović, plagiarised his PhD thesis. Ms. Mijatović’s reaction was backed by Mr. Saša Janković, the Ombudsman of Serbia, who also warned of an “emergency situation” in terms of freedom of expression in Serbia that followed a real emergency situation of the floods in May. As a response, Mr. Vučić requested an apology from the OSCE, an action not to be expected from a prime minister. The apology never came. Since then, several news editors have been fired, while the major critical political TV show Impression of the Week (Utisak nedelje) has been cancelled, with its author claiming that it has been practically banned (Link). What are the concerns going forward? Marko Čeperković: At the beginning of the current year, Serbia undertook the path of accession negotiations with the European Union. According to the Copenhagen criteria (the rules governing eligibility for EU membership), media freedom is a pertinent issue to be taken account of and is assessed in the EU Commission’s Progress Reports. The last Report issued in November of 2014 shows that the Commission has in fact registered this worrying tendency and has drawn attention to the censorship and lack of media independence and freedom. Moreover, the assessment of the OSCE’s Office for Democratic Institutions and Human Rights (OSCE/ODIHR) is supported in regards to media reporting being insufficiently analytical and “influenced by the political parties in power, including through public funding, which led to widespread media self-censorship” (Link). Additionally, “there are concerns about deteriorating conditions for the full exercise of freedom of expression” (Link) In the future, the main fear remains that the current situation will result in further attacks on media freedoms, and suppression of investigative journalism, rise of self-censorship, and moving backward in the process of democratisation of Serbian society.